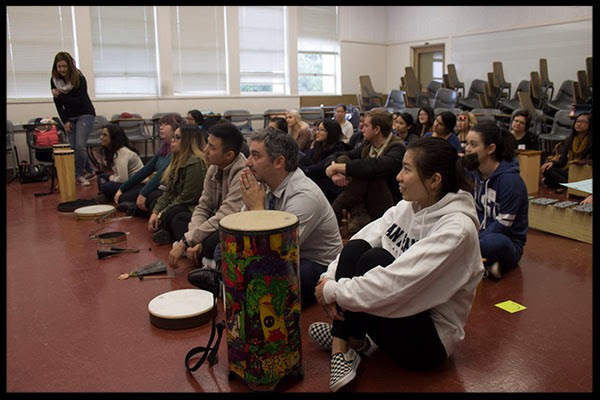 San Jose State University students and community members participate in the 2017 Marion Cilker Conference for the Arts in Education in a session where they learn to incorporate music into class lessons. Marion Cilker, a 1939 alumna of the College of Humanities and the Arts, had a lifelong passion for arts in education that she wanted to share with future generations of teachers. 70 years after her own degree completion, she donated to the Connie L. Lurie College of Education to establish a scholarship and conference to foster the same ideals in prospective and current educators. Cilker was both an artist and an educator who worked at Turlock High School in California’s central valley for many years – teaching stagecraft and art. But her love of the arts was born long before that, even before she attended what was then known as San Jose State College. She discovered art in high school, and it led her to her college major, a career and travels around the world, including a first trip to Europe after high school to see art masterpieces. Sarah Henderson, ’18 Child and Adolescent Development MA, is one of three recipients of the Marion Cilker Scholarship for Infusing Art into Education, who shares the same passion for arts in education as Cilker. “I applied (for the scholarship) because my research interests involve arts in education and arts as a means for higher positive outcomes for children in schools,” she said, noting that the scholarship is helping her complete her education as well as prepare for her future goal to continue research in that area. “I would like to obtain a PhD, possibly become a professor, and work in advocacy with nonprofits or policy-influencing organizations in order to shift public perception on the arts. Katelyn Palmer, who will complete her single-subject credential in spring 2018 for teaching art, is another of the scholarship recipients. After she graduates, she hopes to get a position as an art teacher at a high school or middle school with a high special-needs population. “I think making art collaboratively can be synonymous with making connections so I hope to give students more tools to communicate and advocate for themselves and others which they can learn inside the classroom community and bring out into the world,” she said. Henderson and Palmer both volunteered at the 2017 Marion Cilker Conference for the Arts in Education, co-sponsored by the College of Education and the Santa Clara County Office of Education. The Nov. 3-4 conference brought together students, teachers and parents with local artists and arts organizations to share the joy of teaching through the arts. The conference included a half-day session on Nov. 3 that was free for SJSU students with about 200 in attendance and a half-day session on Nov. 4 for teachers, parents, administrators and interested community members. About 80 people participated in the Saturday sessions held at the San Jose Museum of Art, the Children’s Discovery Museum, Movimiento do Arte y Cultura Latino Americana (MACLA), San Jose Museum of Quilts and Textiles, and Works/San Jose where artists and arts organizations gave presentations and planned activities. “The best part of participating was attending sessions and exploring the Children’s Discovery Museum,” Henderson said. She led a group of attendees to presentations and participated in activities on Saturday that included creating a nature journal and creating instruments out of recycled objects as well as writing lyrics to the tune of any children’s song. Henderson agreed that the artistic activities benefit students well beyond art class. During welcome remarks at the Friday morning session, SJSU President Mary Papazian shared her own thoughts about arts in education. “It is important to understand that no field can exist without the arts—engineers need to use CAD software to imagine their creations; programmers need to work with designers to create an attractive product; all companies need advertisers to sell their products using imagery,” she said.